Photographer Danny Lyon spent the '60s in the South, photographing the Civil Rights Movement, traveling with motorcycle gangs, and creating some of the images that would make him one of the key artists of 20th century documentary photography. 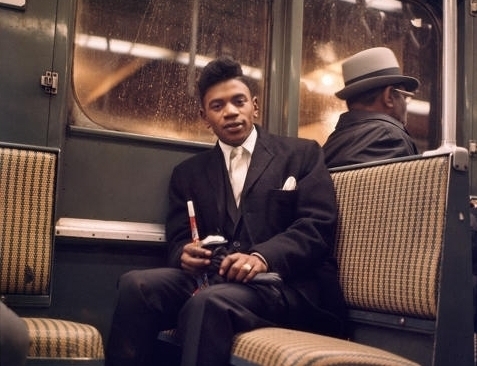 Upon returning to New York City in 1966, Lyon began photographing subway commuters around town, capturing the curious intimacy and anonymity of public transportation. Lyon told Fast Company, "When I speak with someone on the subway, I find New Yorkers easily slip into a conversation. Then they step out of the door and are gone." The photos, many of which were taken on New Year's Eve night, are being shown for the first time in the MTA Arts & Design exhibition, Underground: 1966 at the at the Atlantic Avenue-Barclays station. They'll be on display for a year.